Hello from Greg! Seeking info on 3 locks. Thread: Hello from Greg! Seeking info on 3 locks. Hello my name is Greg. I'm really excited about these 3 locks I just acquired. If anyone has information about them I'd greatly appreciate it. Point of interest: lock marked banklock 555 cannot be opened unless you push a spring loaded rivet to make it function. Also, how can I obtain a key for the brass lock marked mastodon? Thanks for any help you can provide. I recently got this Brass Mastodon Eight Lever on ebay with no keys locked. I have never seen a brass one so had to grab it. Got it for $22.50 I couldn't believe it, nobody bid against me. Got it open made 2 keys for it works perfect. I also have a regular steel Mastodon Eight Lever I made keys for too but this brass one rocks. The first lock I have never seen before reminds me of old smokehouse lock. The key looks to have a real looking head and shaft but the bit is very complex. Looks very delicate be careful with it. The Eagle Brass Mastodon is your best lock as far as I can tell looks very good. I was able to make keys for mine as I am a good old locksmith. Getting blanks for it can be difficult that have large enough hole in them. I was lucky and ordered 20 vintage blanks when I seen them available but still had to enlarge and deepen the hole a little. Strange because they fit the steel Mastodon perfect but the brass one the pin is a little larger and longer. The one that says Bank Lock 555 I am a little suspicious of. The key looks to have simple looking cuts and looks a bit crudely made. I have seen many of those type that say "Bank Lock" on them on ebay and all of them are made in India that I have seen. They say 6 lever some say 10 but usually have no levers in them at all. Some insist they are not reproductions others admit it is. Yours may be real but could be a reproduction. If you find a different key that fits in it and it also pulls the bolt back and unlocks it and any key you try does the same it has no levers in it and likely is a reproduction. That spring loaded rivet you speak of I have never seen that before. Others have addressed the Mastodon and the no-name. 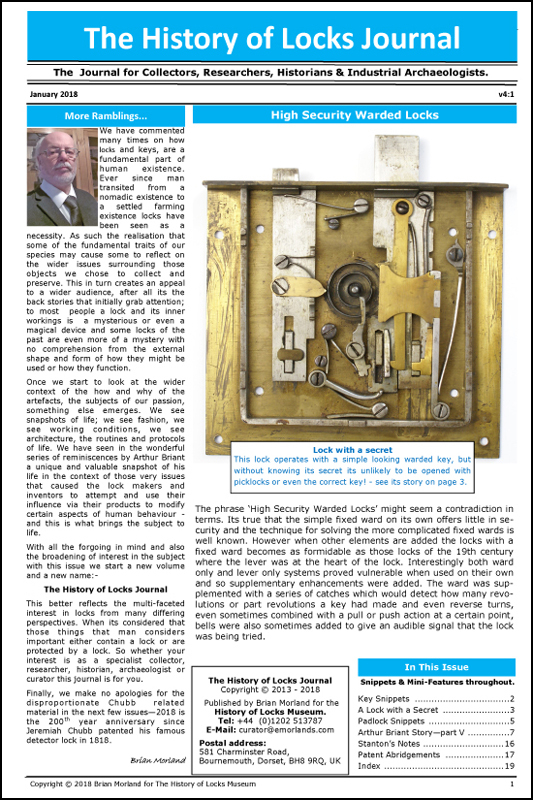 The lock marked Bank Lock is a standard trick lock made in Alagarh(sp) India for at least the last 40 years. The trick is most effective if you hold the rivet in while turning the key as holding it in after turning the key will allow someone to hear the loud click of the trick being activated. I bought mine around 35 years ago. Why does it look like all but 2 large rivet heads have been removed and then re-staked whats left with a punch as you can see what looks like the large outline of the big rivet heads indented on the face of this lock? Does yours look like that or has this one been taken apart and re-staked for some reason. Can you show me a link to one of these trick locks someplace? I see India made Bank Locks listed but they are not this one yet shape looks the same. The attached pictures are of my version of this lock.